A Zimbabwean court found activist pastor Evan Mawarire not guilty of subversion on Wednesday in a case that has been scrutinised as a barometer of independence of the courts under new President Emmerson Mnangagwa. Mawarire has been a strident critic of former President Robert Mugabe, who was forced to resign after 37 years in power last week under pressure from the army and ruling ZANU-PF party. "This could be evidence of a freer Zimbabwe but this case had no legs to stand on. 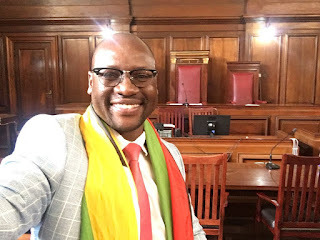 I think a lot more needs to be seen to determine whether this is a free judiciary going forward," Mawarire told reporters in the court room soon after Judge Priscilla Chigumba's judgment. Critics allege that Zimbabwe's courts for decades have been used as a tool of political repression. There was a sigh of relief from the handful of people in the court when the ruling was made. The pastor's #ThisFlag movement had been a thorn in the side of the former Mugabe government. In 2016, he led a stay-at-home demonstration that lead to the first of his several arrests.